A 1/2 cent or a 1/2 percent sales tax? Words used in the San Luis Obispo County Measure J-16 on the Nov. 8 ballot will mislead voters by stating a ½ cent sales tax instead of what it truly is ½ percent sales tax increase. When propaganda and swaying the voter is your goal you use words like penny-cent instead of a multiplier that is a percentage. Most voters understand that Sacramento has taken our sales based and other tax type dollars and chosen not to send them back to our county to fix roads and infrastructures that they are mandated to fix. San Luis Obispo Council of Government’s survey, paid by your tax dollars, revealed that an increase in ½ percent countywide sales tax would fail to achieve the ⅔ votes needed in an election. So they played and played until our city councils and special interests groups got compensated (bought off) resulting in local government support for this measure to be placed on the November ballot. Don’t be fooled or played by our county government or special interests supporting this new tax as there is no guarantee that your roads will ever be fixed. Other past tax dollars earmarked for roads did not return as promised. 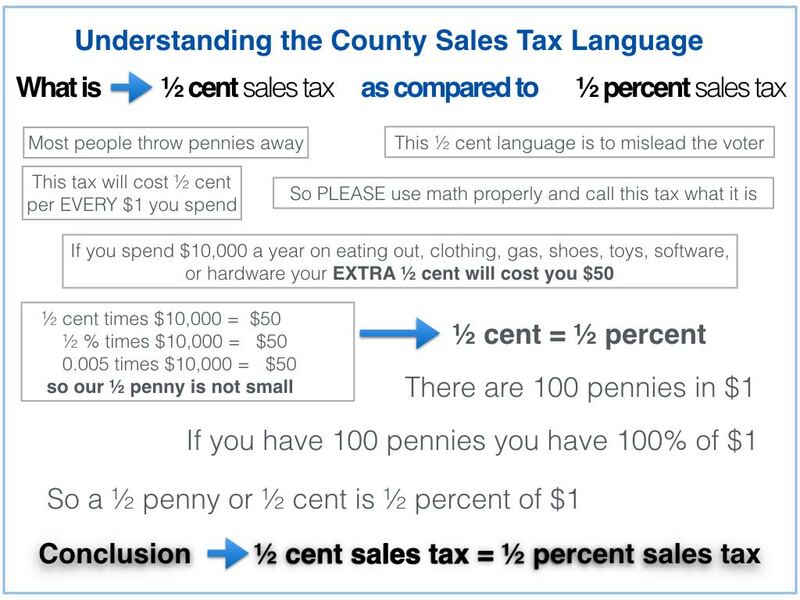 This chart has been provided for those that may have been confused about the meaning of ½ cent versus ½ percent that county government chose for the verbiage of the ballot measure. The ballot measure should not have been allowed to use ½ cent as it is very misleading. Words do matter. Vote NO on Measure J-16. Note: There is a correction on the following graph. Laura Mordaunt resides in San Luis Obispo. She is a former aerospace systems engineer with a degree in Mathematics from San Jose State University. Correct me if I am wrong, but isn’t a 1/2 cent equal to 0.005? 0.05 is 5/100 of a dollar or 5 cents on every dollar. The actual tax increase on $10,000.00 would be $50.00. I don’t care who took our tax money. Government needs to be dryed up. I can’t believe anyone would actual vote to increase taxes on themselves thinking the increase will help. In the old days a politician would run on a platform to improve things with what was available. Let’s throw out these clowns and let them know there is no more money. Deal with it! SLOCOG the sponsor of this measure has lost most of their funding which one my relate to job security. If you closely look at the “pie” where approximately 45% of the funds will go to are those projects that are manged by SLOCOG. This is just an end run around to fund SLOCOG thru the incorporated cities. SLOCOG is somewhat of an independent agency, they are a group of the 7 incorporated cities and the county and appear to answer to no one in particular. In the past they granted themselves a 8% pay raise. With that said you can kind of guess where most of this money will go. Mostly towards studies to keep SLOCOG active and then because of the increase workload more employees, pay raises and additional benefits. This is certainly a buyer beware situation. There are a handful of elected officials who have come out against this measure. I think it will be interesting if they come out and support their cronies who are up for election who support the measure. This will be a true test of character or lack of. I get it that the wording is misleading but if you folks think that hanging your hat on the wording is going to somehow defeat the Measure you’re on the wrong tack. The issue is whether or not the tax is fair or not, or is there any correlation between how much a person uses the road system in the County and how much sales tax they generate. I’d spend my energy making sure people know there isn’t much of a correlation between how much driving you do and how much sales tax you may contribute. In fact this whole notion of living closer to work and shopping means you will most likely pay more in road tax for driving less. Know I will be there! NO ON MEASURE J! While I agree with your logic and need for transparency, your math is wrong. A 1/2% sales tax increase on $10,000 is $50, not $500. The Polls are showing it won’t pass and if we keep getting the truth out we can stop it! Although the elected officials approved the measure it was designed and promoted by the over compensated bureaucrats. For several decades now we have been living with the tyranny of the bureaucratic state which pursues its own interests. As a result we are over taxed while essential services are short changed. I for one would be willing to contribute to to an effort to seek an injunction to keep the measure off of the November ballot. I know time is very short, but we need to fight back on this type of nonsense. These “public servants” need to get the message that this obfuscation has to stop. How about plain direct English for a change. Well, if you’re going to be so very specific about wording, then you should be more accurate and say that it is a “1/2 of one percent sales tax increase” and not “1/2 percent sales tax increase.” A 1/2 percent sales tax increase would be 1/2 percent of the current sales tax of 8% or $0.0004. Geez. 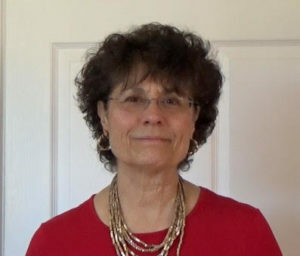 The county attorney, Rita Neal wrote the “neutral” ballot language. Unfortunately, it would require a lawsuit to challenge this misleading language, so it’s not worth it. But it does go to illustrate how the agencies pushing this shoddy tax measure take every advantage to mislead voters and misstate to the voters what it actually does.